In today’s Tools of the Trade feature the ‘rock room’ will rant about one of the most famous guitars in the annals of rock and roll history. John Lennon’s 1958 Rickenbacker Capri 325 (serial number V81) is not only one of the most recognizable instruments in rock history, but an instrument that assisted in providing the soundtrack for the 1960’s as well as inspiring a host of prospective future musicians and garage rock bands. While much has been written and discussed about the guitar its importance cannot be understated. While amplifier shopping with George Harrison, Lennon first came across the solitary instrument in a guitar shop the location of which there is some debate. 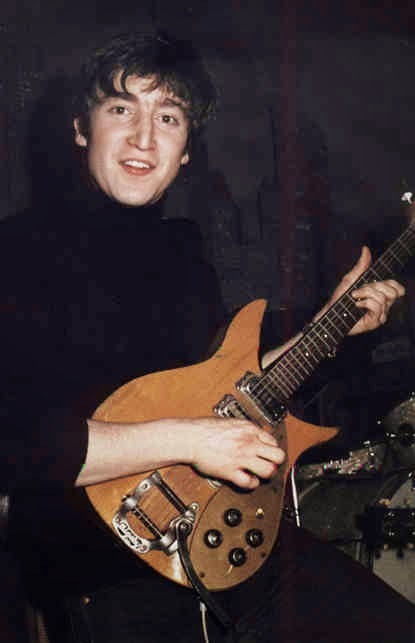 Lennon fell in love with the sleek alder body and 'futuristic' look of the ‘short arm’ guitar, referred to as such because of the 5/8’ width and 20.75’ scale of the also alder neck. These specifications are stellar for rhythm players more than for lead players and the instrument fit Lennon’s needs perfectly. The guitar also featured a lustrous gold pick guard and a natural grain sweet honey finish, four rotary controls and three short pole toaster pickups. The guitar came outfitted with Grover tuners and a Kaufman vibrola. Guitar aficionado’s often wonder why Lennon would decide on an guitar so demure in its specs. While I do not have the answer, the easy assumption is Lennon liked a smaller instrument he could grasp and really dig into. 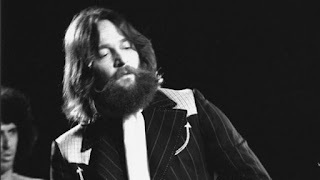 Fast forward to August 30, 1972 when Lennon appeared on stage at Madison Square Garden, his instrument of choice for his return to the stage was a Les Paul Jr. A bit bigger n the neck but similar in the way it fit Lennon’s stance, hands, and performing attitude. When Lennon held the Ric on stage in the Beatles formative years the guitar looked like a weapon. Tucked close to his body, the instrument was ready to disseminate chrome lasers of rhythmic sound at Lennon’s urgent rock and roll insistence. The Beatles were the true early punks and Lennon's unique instrument, approach and sound identified him as the biggest rock and roll punk of all.. 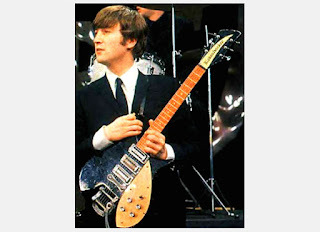 Reportedly, only eight of these unique guitars were made by Rickenbacker and luckily for rock three were shipped to Germany and one was eventually purchased by Lennon. The natural finish Rickenbacker was a first run and special in the aspect that its solid body contained no ‘f’ hole (later models would). As soon as Lennon purchased the instrument other unique modifications started to be made. If you are a ‘rock room’ reader and familiar with the Tools of the Trade series one consistency with all of the instrument stories is that the owners are often making modifications in a constant search for the perfect sound. Soon after bringing the famed guitar back to England Lennon had the vibrola removed and refitted with a more substantial Bigsby vibrato bar in addition to removing all of the knobs and replacing them with Hofner knobs at first and later what look like TV/radio knobs. The guitar soon became Lennon’s go to instrument on stage. The thick wire brush tone of the Rickenbacker cut through the beer drenched smoke of the Reeperbahn clubs, driving the Beatles early amphetamine rhythms to lofty and kinetic peaks. The guitar has an instantly identifiable treble punch, that while situated in the pallet of the Beatles sound coagulated all of the Beatles instrumentation into one undulating rock and roll freight train. 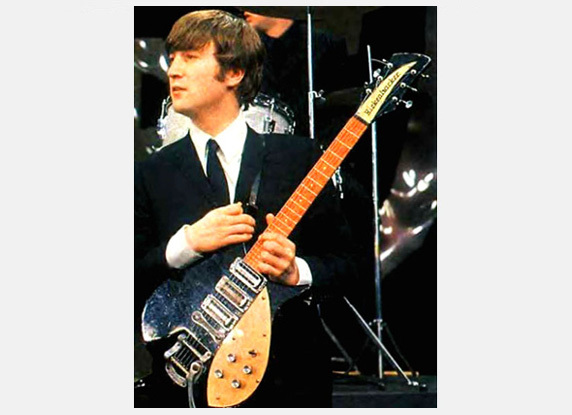 Lennon’s sound would also influence band mate George Harrison to soon move from Gretsch to Rickenbacker as well as influencing artists across the world, (McGuinn, Townshend) to base their respective groups’ aesthetic around the silvery shimmer of the Rickenbacker. 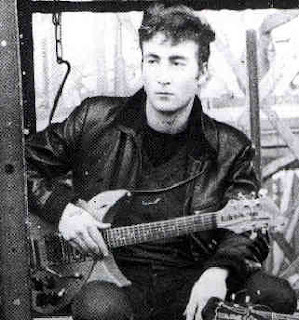 By late 1963 Lennon would make another change to the guitar when he had it painted in its now famous jet black. The reason for this change has been the subject of much debate and speculation, but as history shows Lennon has a documented habit of messing with his instruments through artistic additions and quirky modifications. This trend started in the early years with the Rickenbacker, moved through the Beatles years with his refurbished Epiphone Casino, his solo era with the aforementioned Les Paul and into the late 1970’s with his ‘space’ guitar. Documentation speculates that Lennon’s painted the guitar to cover for damage that had occurred in the hundreds of stage performances, also that it was a request from Brian Epstein to match the Beatles new and slick public image. It could also to have been for conformity reasons with Harrison's black Duo-Jet. Regardless of the reason, this new appearance for the guitar coincided with its movement to iconic status right along with the Beatles ascending popularity. Lennon would use the guitar on stage for their famous debut on Ed Sullivan and through the recording of the Beatles 1964 LP Beatle For Sale, its tone solidifying the Beatles early sound. The Ric would eventually be replaced by a newer model in early 1964 when Lennon was given a new Rickenbacker 325 in addition to a twelve string version from the guitar company. The original Ric would disappear for a few years but always held a sentimental place in Lennon’s heart. Songs that illustrate the guitar doing its work and disseminating its tones of special note can be found in the early black and white footage of the Beatles at the famed Cavern Club in 1962 which I have included below. The Rickenbacker is the central impetus of the band’s sound in this era, scrubbing the crowd into a frenzy and encouraging the power of the revolutionary music. ‘All My Loving’ from With the Beatles is another sterling example of the resonant and resounding Lennon tone and approach. The Rickenbacker churns under the melody of the track, its electric chording, exceptional and exciting. The two volumes of the Beatles BBC collections spotlight the Rickenbacker on the majority of the tracks, its aforementioned 'ring' nestled in sympatico with Harrison's more placid country tonalities. For an example of Lennon making it 'howl and move' check out 'You Can't Do That' where Lennon takes the mid tune solo for a ride on the rails with an aggressive round of string bending. By the mid 1960's for all intents and purposes the guitar had been retired. In 1972 post Beatles, Lennon commissioned to have the guitar restored to its original specifications. According to various reports the guitar had seen better days, but after a lot of TLC, electronics work and general repairs the guitar was returned to its original glory. Today the instrument looks like it did when Lennon walked into the Hamburg music store those many years ago, except for a white pick guard which for unknown reasons replaces the original gold that adorned the guitar when it was built. Currently, Yoko Ono owns and cares for the instrument and it makes rare and brief appearances now and again, most recently at the John Lennon Museum in Tokyo, Japan. The elements of its construction still retain the musical ghosts of the past making it one of the most, if not the most iconic guitars in rock history.